The next frontal system will push rain and thunderstorms into the area on Thursday. Once again, ingredients are in place to warrant a 3 out of 5 “enhanced” risk of severe weather. Take this day of quiet conditions to review your severe weather plan, and we’ll have no problems getting through tomorrow safely. Today and Tonight: Clouds will thicken on Wednesday, though a bit of sun may break through. High temperatures will warm into the low 80s. Southeast wind flow may result in a touch of humidity as well. Skies will turn overcast overnight and the advance of Gulf moisture ahead of our next cold front will hold lows closer to 70. Up Next: Thursday will mark the fourth considerable severe weather threat in a two-week timeframe. It is not necessarily unusual in the month of April as in a progressive storm pattern, fronts can be expected once or twice per week. Individual storm cells will begin to develop late morning or early afternoon followed by a cold front with a line or cluster of rain and thunderstorms during the late afternoon and early evening hours. Damaging wind gusts, tornadoes and downpours are the main threats. Rain will wrap from west to east Thursday night and cooler air will sweep in behind the boundary. Friday will begin in the 50s with highs struggling for the 70s with some clouds lingering. Gradually moderating temperatures are expected beyond this for mild and sunny Easter Weekend. The next rain will not come until Tuesday at the earliest. The Mississippi River: At Baton Rouge, major flood stage continues with a level of 40.0’ as of Wednesday morning. Peaking at 44.1’ on March 19, the river set its 7th highest recorded crest at Baton Rouge. In addition, at 102 days this is now the 3rd longest period above flood stage. River flooding and drainage north of the area will keep the river steady over the next several days. The high water is primarily an issue for river traffic and river islands, although some inundation will continue unprotected low-lying areas. The city of Baton Rouge and the main LSU campus are protected by levees up to 47 feet. Some soggy areas and seepage may be noted due to the long duration of high water placing pressure on the levees. As some of the Mississippi River diverts into the Atchafalaya River, gauges at Krotz Springs and Morgan City will stay high as well. This creates backwater flooding in parts of Assumption Parish in areas such as Stephensville and around Lake Palourde. Like Big Muddy, this is expected to be a prolonged event but is not uncommon for the time of year. Read more HERE. With an area of surface high pressure parked over the Eastern U.S., onshore flow along the central Gulf Coast has resulted in dew points returning to the 60s. These numbers will continue to rise and provide moisture needed to fuel a cold front to produce rain and thunderstorms on Thursday. Clouds will lower and thicken through Wednesday but we should remain precipitation free until at least the nighttime hours. Thursday will work out to be unsettled and stormy. An area of rain and thunderstorms associated with a surface cold front will be ongoing across Texas as the day begins. A trough moving out of the Southwest U.S. into the Mid-Mississippi River Valley will help to strengthen a surface low along the front in northeast Texas. The surface low will race northeast allowing low level, southerly winds to increase. This will carry ample moisture into the central Gulf Coast states ahead of the cold front. These factors will allow that morning area of rain and thunderstorms to re-strengthen and organize into a squall line as it moves into the local area. Lift from the front and wind shear aloft will be strong enough to keep storms “ventilated” and therefore well maintained for an extended period. This line will be capable of widespread damaging wind gusts and possibly embedded tornadoes. Any storm cells that develop ahead of this line will have enough low and mid level spin available to spawn a tornado, though this threat comes with lower confidence. The Storm Prediction Center has placed the entire area in an “enhanced risk” for severe weather. Additionally, the entire local area has been mentioned for the possibility of “significant” severe weather, including 75mph wind gusts or stronger and EF2 tornadoes or stronger. 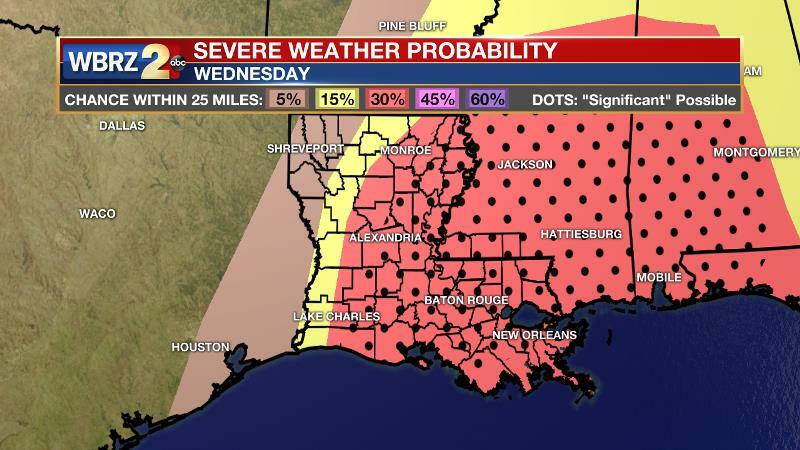 There is a 30 percent chance of experiencing severe weather within 25 miles of any given point in that area. This system will exit on Thursday night with rain ending from west to east. Temperatures will briefly cool below average through Saturday morning but clear seasonable weather is then anticipated into early next week.